← TURKEY: Our Rage is Growing, So Does Our Struggle! This morning, a large operation involving the the police and High Court Enforcement Officers saw around 75 residents being evicted from their homes in Rushcroft Road, central Brixton. Rushcroft Road was once home to a large and thriving community of squatters, artists and Brixton characters – some may say that their presence helped define much of what has made Brixton such an attractive place to live – but it looks like the final curtain is about to come down as Lambeth’s ‘co-operative’ council prepares to evict the remaining 75 residents. Many of the residents have lived in their flats for a generation, and have raised families here. Since the Council decided on an ‘evict and sell’ policy there’s been a steady haemorrhage of long-term residents as some families accept housing transfers and move away from the road. Back to today and it looks like we really could be reaching the end of an era. 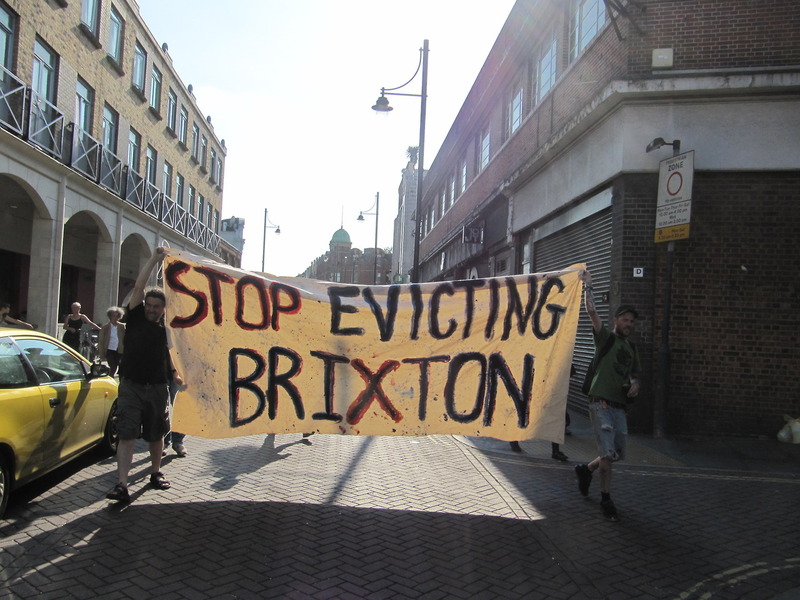 We are 75 people living in six blocks of flats in central Brixton who are facing eviction from our homes on July 15th. We live in property that Lambeth Council has not maintained or looked after for the past thirty years. Lambeth council is pushing ahead with its plan to drive more of us out of Brixton, to develop private housing, only affordable for the ultra rich. Now we are being ripped out of our homes to make space for ‘corporate clients’ (see letter above). Foxton’s will charge people upwards of £2000/week to stay in our flats and/or they will sell them for half a million pounds. Most of us have lived in the properties for many years, often decades. One person has been here 32 years. Some have families. Lambeth claim they will renovate three buildings as social housing and sell the others. This is a story we have heard before. We have watched them sell off, bit by bit, all properties from previous evictions on Rushcroft Road, Clifton Mansions and a large proportion of Brixton’s original short life housing. They will do the same to these flats. 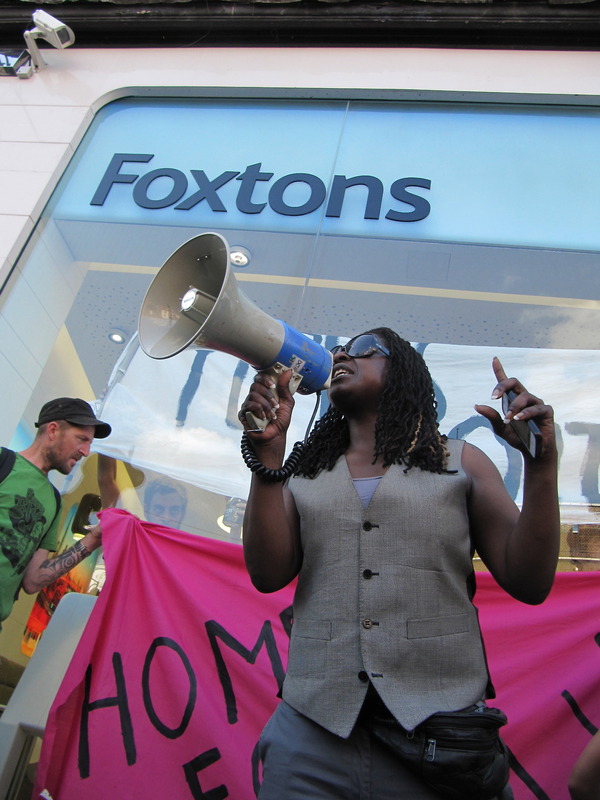 Central Brixton will be gentrified – and those who are already here (like us) be pushed out. We are a community of people in who all attend to priorities that capitalism neglects. We are part of this city and part of central Brixton. Many of us have landed where we are through years of service to our communities, commitments to fighting for justice and/or creative and artistic pursuits. We do the type of work that makes this kind of rent simply impossible. If Lambeth insists on running the people who have values stronger than the relentless pursuit of profit London, they will make this city into a sterile corporate hellhole, devoid of authenticity. We would like to stay and we are fighting for the right to stay. We have explored many avenues for making this possible. We have proposed a cooperative where we can self-manage our own housing in a building owned by the council. We can show Lambeth (the ‘cooperative council’) how cooperative organisation is possible. We have the skills and social capacities to organise cooperatively. This is more than Lambeth council can say! Lambeth Council advertises itself as the ‘cooperative council’ but it behaves as an authoritarian manner. We demand that Lambeth Council honours their commitment to cooperative organising and stops attempting to evict us from central Brixton. 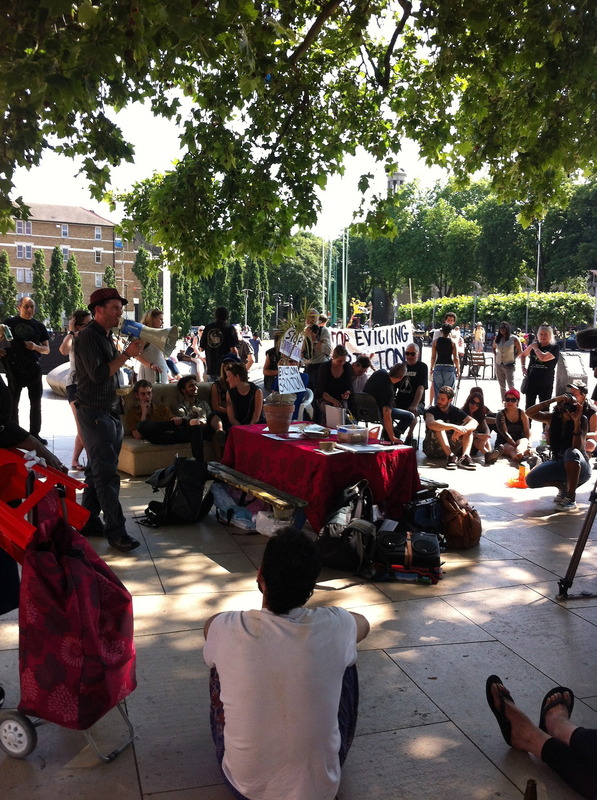 An anti-gentrification event was organized on Saturday July 6th 2-5 pm on Windrush Square. They were talks about evictions and gentrification in Brixton. It was an art auction to raise money for the eviction fund. There was a standing protest and finally music. Resident No.1: Austerity is a lie – We will not be Zombified! There are many people with radically different stories to tell on our street and different ideas on what is happening regarding this upcoming eviction. This short blog reflects only my own point of view. Since we now live in a world where those of us in precarious housing and employment are routinely vilified and humiliated by the press I will write anonymously. I have lived in my home in central Brixton for seven years. I love it here, I am close friends with some of my neighbours and have dedicated years of service to local community projects. Despite these facts, if this eviction was simply about Lambeth reclaiming property in order to create social housing – I would simply move out when asked to move on. I count my blessings for having been able to live in unused, affordable property during the time I completed my education and worked on projects with very little or no financial reward. Yet what is happening in Brixton is not about Lambeth council attempting to improve conditions for its residents by building more social housing. What is happening in Lambeth and the UK more widely is a wholesale destruction of the social net in order enable a greater transfer of public wealth to the ruling class. We are told that we must accept austerity and there is no other option. This is a lie. What we have is a set of circumstances directly created by the deregulation of the financial industry. Subsequently, the 2008 crash is now the direct cause of the on-going economic crisis. Transition Town Brixton held a ‘Local Economy Day’ event at Lambeth Town Hall in June 2008 where we discussed such a crash as an inevitable part of the current economic system. The crisis was obvious and predictable to many of us with a critique of capitalism and an informed environmental analysis. The deregulation of the financial sector was almost inevitable within the current political regime. When people say ‘there is no alternative’ it is true that within capitalism there is an increasingly narrow range of opportunities. Capitalism is a system that extracts as much social and ecological value as it can (for as low of a cost as it can get away with). Those people and those parts of the planet that can be exploited (without political opposition) are exploited. Wealth is increasingly concentrated with those who have the fewest scruples in regards to exploiting the rest of us. The rest of us have increasingly less political power to make any significant changes. Within this system, social and ecological crisis (such as the one we are experiencing now) are inevitable. Thus in one sense it is true that there is no alternative – if you are committed to capitalism above a commitment to social justice and ecological sustainability. Since the public has uncritically accepted the lie of austerity, we are now witnessing the sale of the NHS to private interests, the sale of vast amounts of public housing to private interests, the defunding of higher education and the slashing of social programmes that are the basis of survival for million of people. The result is an unprecedented assault on the most vulnerable and a generational assault on the young. Meanwhile, social solidarity is at an all time low as those with a bit of privilege strive to keep themselves from becoming the latest victims of this governments’ assault on its people. Witnessing the consequences, it should become increasingly clear that austerity is a myth that must be resisted. Austerity is part of an ideological project run by governments that serve the interests of a small class of people. What this means in Brixton is that people who have lived in Lambeth for decades are now being evicted from their homes and offered a room a hostel. Many others are simply being evicted and told to move on. Many have nowhere to go. 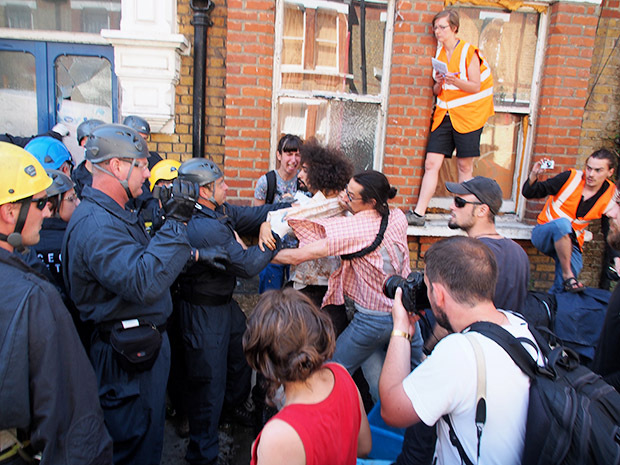 Housing tensions are so high that two bailiffs were shot this week when carrying out an eviction in Brixton. We cannot afford the insane private rents in this city so we will have to leave our communities to the ‘corporate clients’ and the ‘guardians’ who are now moving in. The lifeblood of this city will be replaced by a new zombie corporates. Whatever happens over the next few weeks on Rushcroft Road, my hope is that we can make the point that austerity must be resisted. Resisting austerity is necessary for sake of survival of common decency. Moreover, if we do not resist the regimes that create austerity this political system will destroy the climate and what is left of biodiversity. Austerity is an ideological project not a necessity. Resisting austerity is the most urgent part of the project of creating viable alternatives. 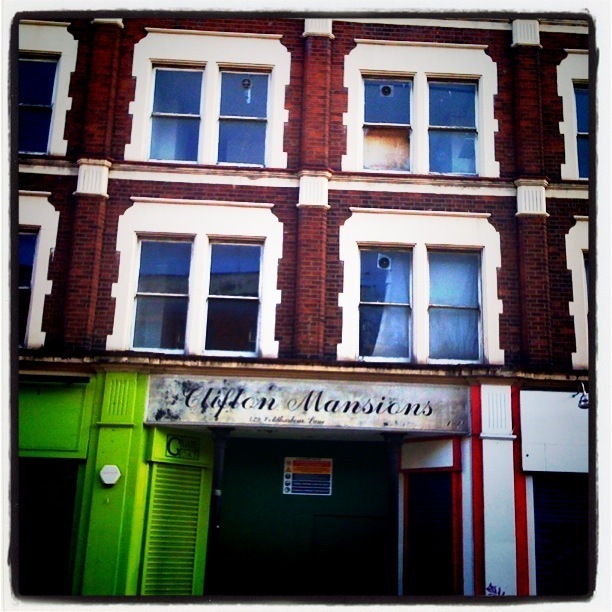 Once an important part of Brixton’s cultural heritage, the former squats at Clifton Mansions on Coldharbour Lane are now available to rent after being renovated by the powerful, super-rich property developers, Lexadon. The 1920s mansion blocks contains 22 self contained flats and once played a significant part in the local music and arts scene, with alternative musicians and artists such as members of The Pogues and the Turner Prize winner Jeremy Deller squatting there. Estate Agents Haart are currently offering three bedroom flats in the building for £2,100 per month. I suspect that price tag will be out of reach for many of the new generation of local artists and musicians. 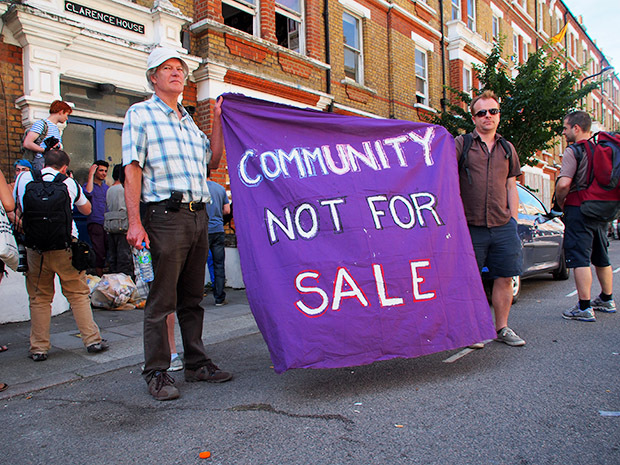 A Freedom of Information request was sent to Lambeth Council to investigate the costs of evicting a long term squatted building in Brixton last summer. 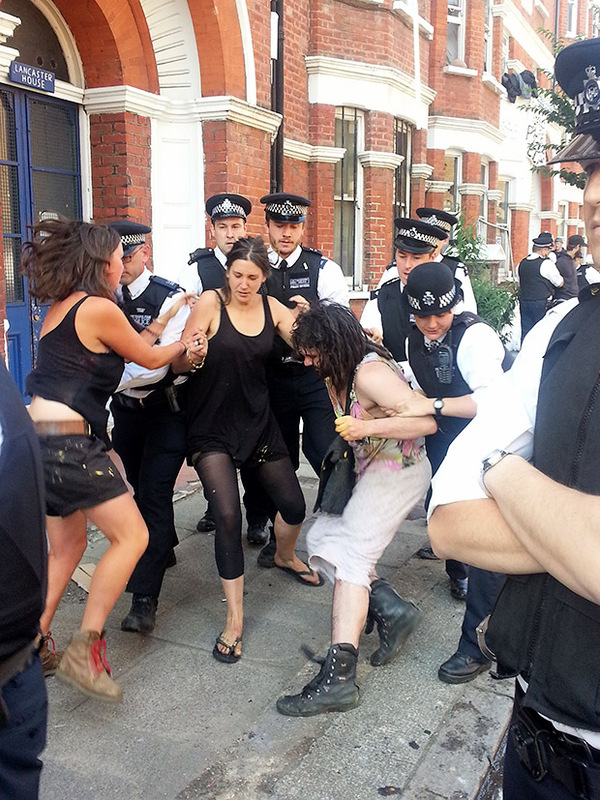 In July last year Lambeth Council evicted Clifton Mansions, a council owned block of 22 Victorian flats that have been squatted for the past two decades. 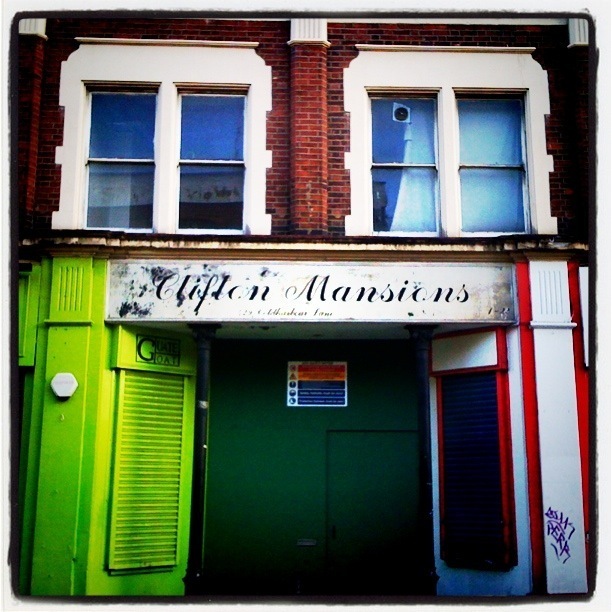 Clifton Mansions is typical of a property that had been left derelict because its owners have not bothered to make use of it. Instead, individuals took it upon themselves to make homes for themselves in the flats at no cost to the state. While squatting may be detestable to those who hold property rights as the bedrock of civilization, for many squatting is a pragmatic solution to the extraordinarily high costs of housing and the surplus of houses that stand empty, unused and wasted. This new law that elevates the right for a building to stand derelict over the right for the poor to create homes for themselves. Let’s be clear – it is already legal to evict squatters when you want to make use of a property (or sell it). The point of this law is to criminalise the precariously housed to give more power to the landlords – as it is only adding additional costs to the public purse. Take Clifton Mansion as an example. The Freedom of Information response justified the expense with the following statement: ‘we urgently need to release the capital in the building to invest in our council housing stock. The money released by the sale of the block will dwarf the amount spent securing the building and safely evicting illegal occupants’. There are two things wrong with this statement. The first is when the council does sell this severely damaged derelict property they will have wasted a large slice of this sale on an overzealous eviction. 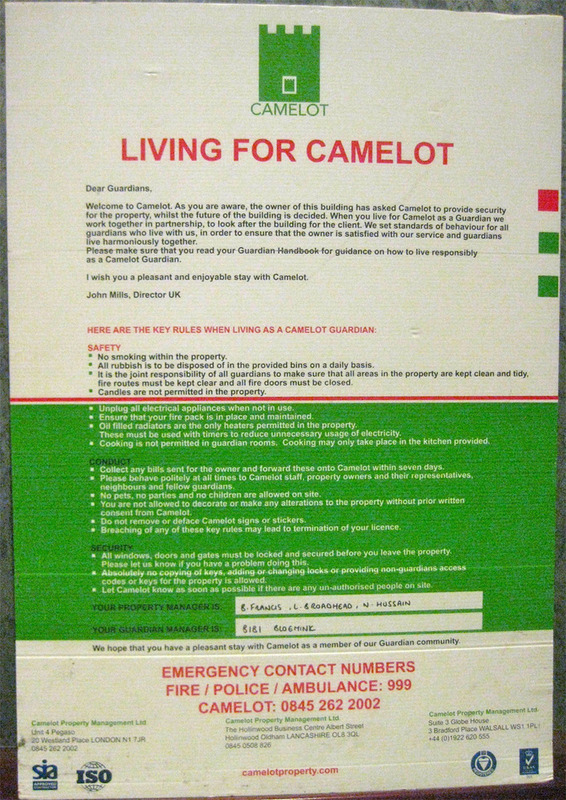 Secondly, the council have not sold Clifton Mansion, but instead they have paid Camelot, a property security agency, £63,976.80to make the flats habitable. Posted on July 15, 2013, in Europe and tagged Squatting, UK. Bookmark the permalink. Leave a comment.